Gigi LaMayne is all good dear Sir. Thank you for the interview. It’s definitely gonna be a good one. Well, tell us a bit about Gigi LaMayne, as someone’s daughter and as an artist. Gigi LaMayne is the first of her kind. A devoted child who would kill for her mother and a determined individual hoping to make a change in the lives of men and women across the world. She would like to be known as The daughter of Africa. She thrives to be the epitome of female Rap and to represent South Africa as one of the best artists of her time. She is a beneficiary of a democratic South Africa. She is a young black female hoping to become an iconic symbol of victory for her fellow Africans. I am an African Female Hip Hop Artist. Lol I'm sorry but this I have to ask, What is your real name? and where are you from? My Real name is Genesis Gabriella Tina Manney and I am South African. I am one of the few with diverse roots stretching all the way from Zimbabwe to Botswana to The SA!. When did you start rapping? And so far, how many projects have you dropped so far? I started poetry first then moved onto the school of rap between the ages of 11 and 16. I have dropped the award winning mixtape titled, “Circus Café” and have worked on various projects with the likes of Tumi, Bozza, Cassper Nyovest, Slikour, Bozza, L-Tido , Pro, Captain, Maraza, Mr Selwyn, Amu, Captain, and many renowned and talented individuals in the industry. (Only by chance!) And I am thankful. When you decided you wanted to rap, did you also draft a plan that you managed to follow or things just started to happen as you kept on dropping records and performing around town? Things started to fall into place really. People bought into my dream more especially my management teams throughout the years. If they never believed in me… I would have never been on this journey. I merely started dropping freestyles, remixes, many things and woah!!! Before I knew it, There were people and they were listening!!! I have performed at festivals, shows, on television, live on radio and even as a kid at talent shows. Cyphers were the best. They were confirmation that rap was something I could work with. Something I fell in love with. Words cannot begin to describe what I was feeling. I remember people of such high statuses such as AKA and Cassper, they applauded, they loved the speech. It felt like my chaining day, only more formal. On your acceptance speech you mentioned your mom being supportive, and going out with you to watch you on shows. How does it feel having her around with you? and what did she say when you told her you now a rapping and you taking it seriously? She started the rap thing!!! She has always been a fan of the Fugees and she encouraged me to start all this. With her education still comes first. I am At Wits University this year and It is my second last year. She is totally for my career and she understands and believes that this is my gift. Sometimes I feel that she believes it more than I do! She is my everything. Being one of the few female rappers in the industry that is mostly dominated by males, does it make things any harder or if you good you will rise and shine no matter which gender you are? I want to be the best of the males so I just have to work as twice as hard. It is that simple, or complex if you like. If you are good and everything you do is at levels nobody else can reach, then you are set. Do you think its a must for artists to have someone managing them? Why? Artists get emotional especially when it comes to their craft. It is always good to have somebody who has the expertise, knowledge and subjectivity to stand as an extension of your brand. A manager is crucial. Are you currently signed to any label? BENTEY RECORDs #MFE (Money First Entertainment) Dankie San!!!!!! Alongside heavy weights, Pro, RedButton, Captain and SFS. I heard your new joint “City Lights”, actually on repeat right now lol. Is it your new single from an upcoming project or it’s just you celebrating the deal in style? It’s a single of my sophomore mixtape and its just tip of the iceberg. Yall gone be super shocked!!!! Celebration?????? I will celebrate when its all said and done. That will be in how many years?????? Many! It’s dope though I gotta say. Who’s on the beat? Should we expect a video soon? It totally deserves one. What are you currently working on? Should we expect an album soon? COLOUR OF REIGN mixtape under Bentey Records, MFE, Dankie San. That is my new camp and they are moulding me well. Watch this space! I find it hard to compare you with other female rappers, mostly the ones on the other side of the world. Your lyric game is on point, and you get your message across very well without having to sound like someone else. Which one comes first to you, lyrics or flow? It is all an art, a masterpiece. Everything is equally important. I just wanna make god music, and if it means everything is on point for every type of listener, then so be it. I never deconstruct. I put together. Gigi LaMayne was put together as a product of society. So is her music. You are doing very well as an artist and I believe you are also a student. How do you balance the two, music and school? If you love something, you will make it work despite the odds. The tides will be ridden. I just do. I have always been a student that performs and I have always taken my education seriously. It isn’t at all difficult especially when you are having fun! Gigi LaMayne and Genesis never collide. Any big plans you have under your belt we should maybe know about? Wait and See. There is a storm the weatherman cannot predict! Where can people get your music? And where can they get hold of you? Everywhere people/ Reverberation, youtube, newhiphop.com, EVERYWHERE! Any message to all the sisters out there tryna get it? NO MATTER WHAT THEY SAY, YOU DEAR GIRL ARE DESTINED FOR GREATNESS! Pleasure's all mine sir, Big up to KMK. 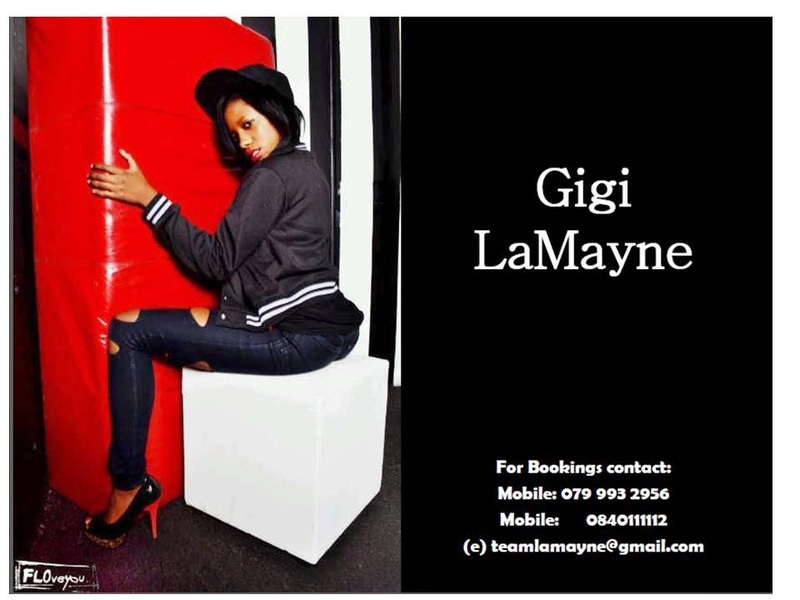 Gigi LaMayne's promo video to her upcoming Mixtape, 'Colour of Reign"